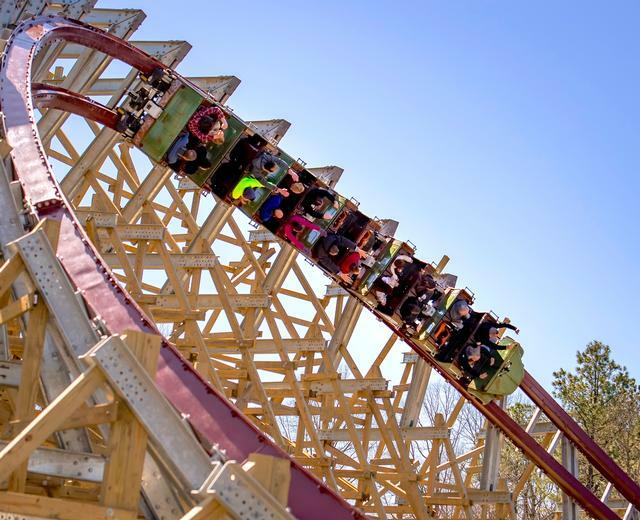 Twisted Timbers is an excellent roller coaster in The Grove and one of the best attractions at Kings Dominion. The Rocky Mountain Construction I-Box coaster features a 109-foot barrel roll drop and a top speed of 54 mph on 3,351 feet of track, including a total of three inversions and nearly 20 airtime moments. It opened March 23, 2018. Twisted Timbers was my first RMC coaster. It did not disappoint. Wild. Unpredictable. Full of unique surprises like the corkscrew drop off the lift hill interspliced with classic wooden roller coaster dips and banks. The signature RMC banks and switchbacks are great fun. I did make the trip to Kings Dominion for the sole purpose of reviewing this for another blog and it far exceeded my expectations. The initial barrel roll drop, trick track elements and airtime hills - superb ejector airtime - make this a real winner. Another RMC masterpiece. Another great RMC coaster. I made the mistake of riding this two days after I rode Steel Vengeance, so it seemed a little "tame" in comparison. However, on its own, it is a great coaster filled with airtime and fun. I thought the middle and back gave excellent rides. My ride near the front seemed to have less intense airtime. You will not regret this ride, every time I've waited in line there were temporary delays (which were to be expected its first week of launch)but seriously, the airtime hills are wonderful, and the psych-out corkscrews that don't invert at all are marvelous. I highly recommend this to anyone who loves a great ride, it might not be the most thrilling but it is wickedly fun.